Yesterday, we took a look at what went on behind the scenes during the making of the Best Of Both Worlds Part 1. Today, we’ll conclude this look by diving into Part 2, here on Fact Of The Day. Piller wanted to have the Borg be defeated by an act of ingenuity, not brute strength. The idea of using their interdependence against them came to him only two days before filming was to begin. He credits the characters for helping him realize this. “I didn’t discover it until the characters did [....] I try to believe in Zen writing; I actually like to stand back as a writer and let the characters speak and listen to them and I’ll sort of like take notes, while they’re talking. Well, that’s what happened in ‘Best of Both Worlds, Part II.’ We got to the scene where they had to solve the problem. Time was running out, there was only ten minutes left in the show. And, um, finally, they came up with the answer that the Borg’s strength was also their weakness, that their... interdependence was their strength, and interdependence could lead to their defeat. And I was just... I can remember the smile on my face when I heard that. I said, ‘Oh, that is cool!’ And that’s how we ended it.. He didn’t like that Part Two was bound by the promises of Part One, mainly the battles. “Part Two had to deliver the goods promised by Part One [....] It has to have the battles and all the stuff I don’t like writing.”. The episode had gone on to become one of the most popular episodes of the series, however Michael Piller and director Cliff Bole have said they felt Part Two was a letdown after a strong Part 1. Cliff Bole stated “I enjoyed doing those two shows more than anything I’ve ever done. They turned out really well. 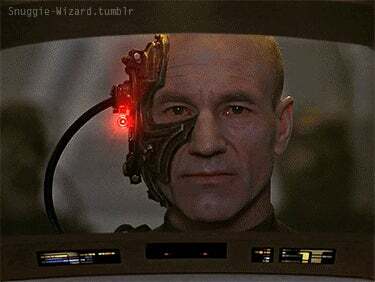 The Borg is like a Klingon. You can do anything you want with them. They’re fun and real expensive to play with. The two episodes do go together, and I wouldn’t put it past Paramount to do that in the foreign markets.” Referring to this episode in particular, Bole commented, “It was also an attempt to do big and fast.” . Piller felt that “The goods” promised by Part One were “not as interesting”. He continued “If you look at it as a two hour movie, it’s really quite effective. As an episode by itself, I don’t think Part Two really has a lot of character stuff.” He was however quite pleased with how the Borg threat was dealt with. . He felt that it had a lasting impact on Picard. “It was a show in which Picard became more human than ever before. He was the indestructible captain, untouchable, above all risk and danger, and suddenly, in this two-parter, he is a man who’s been raped by the Borg and has to deal emotionally with huge consequences. You see the first needle going into his forehead, and a single tear rolling down his cheek. And after that, Picard was more complex, never the same; he was a far more interesting character after that.”. The episode won two Emmy Awards. It won for Outstanding Sound Editing for a Series and Outstanding Sound Mixing for a Drama Series and was also nominated for Outstanding Art Direction for a Series and Outstanding Achievement in Special Visual Effects. . Entertainment Weekly ranked the episode as a two parter the #2 on thier list of the top 10 episodes to celebrate the 20th anniversary of Star Trek TNG. Empire Magazine had it as #37 of the 50 Greatest TV Shows Of All Time. . I think we can all agree that this is good tv. I want to thank everyone who read this far, and like Part One, know there is a lot more interesting stuff in the article I didn’t use. I will see you all on the next Fact Of The Day.